Wow Fun Escape 004 is another point & click escape game developed by WowEscape. 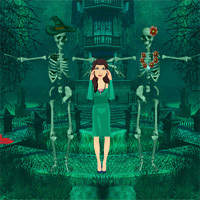 In this game, a beautiful girl got trapped by skeletons. Therefore, you have to help her escape by finding useful objects, hints and by solving puzzles. Click on the objects to interact with. Good luck and have fun! Sneaky hatchet in tree, scene left of start. Sneaky arrow on broken gate. Black crow goes on blood spill. Pour jug on stick girl holding a red heart. Can anyone get the A B C thing to work? I found the value for C.
Don't forget to click 4 circles if the answer is 4 not just the fourth. Do you need to see the clue for C? If so, where is it? I tried the puzzle using the only possible values for C (since the most you can add to it is 3). The puzzle didn't open either way I tried, so apparently you can't BF it. Got a leg of meat, Sugarcrush? Try feeding a ghost. Thanks! I was just clicking the final ones. I can't get the clue from the crow to work and I've no idea how to solve the green/red/yellow ghosts puzzle even though I have the clue. For the green/red/yellow ghosts - the colour of the board is important and then which position the particular ghost is in. 1 2 or 3. Out. Thanks for the help. I must be dumber than a doornail, because I still can't get the ghosts. You can't move the ghosts between columns. None of the logic I think I have works. Help? Ahhh....NVM. The background color changes when you get one right. According to the colour board put 1 ghost of the right shape that is in first position 2 of the one in second and three of the one in third. Got the trophy, put it on the girl...out! Good game, thanks WOW. Thanks fellow players for the help. She'll never stop a pig in an alley, as my old gran used to say. Loved this game. It was a little different and refreshing!!! I could not find a hint as to where to place the bow. It goes lower left in the scene with a mountain skull in the upper right. Then add the arrow. POP - OK, there is a hint, but it's subtle. I believe it's on a bridge. Does anyone els watch Orange is the New Black? Anyone else getting Figueroa vibes from the female figure?